Have the biggest pumpkin on the block. This Halloween window decoration is very simple to make and it's a Halloween activity you and your kids can enjoy together. The pumpkin Halloween window decoration is also a great way to welcome partygoers to your Halloween bash or trick or treaters on Halloween night. You only need a few craft supplies for this project. Once the pumpkin is in place, just flip on the light in your room to make him come to life. Best of all, it's an inexpensive Halloween decoration you can use for years to come. This project requires cutting with scissors and a craft knife. These steps are best suited for adults. The poster board cost 0.99 per sheet. The 10-sheet pack of tissue paper also cost 0.99. Total cost for this project with tax was $7.62. Use the poster board to black out your windows. Secure each piece with tape. You only want to use enough tape to hold the poster board in place for now. You'll actually be taking each piece of poster board down in a later step for cutting. Make sure no sunlight is coming through the window. If it is, that means your indoor lighting will bleed yellow through the outside at night and we want it to be nice and dark for a better result. Tip: Most windows are larger than a piece of poster board. For this project, we bought a couple of extra pieces of poster board to solve this problem. Basically, we needed a poster board and a half to fully cover the window. Cut the extra piece in half and tape it all the way down the full-sized poster board to black out the window. Because you will be cutting all of the poster board, go ahead and secure the sheets of poster board used to cover one window with a lot of tape. That way, the pieces won't shift and mess up your design while you're cutting. Draw a face for your pumpkin on the poster board. Use a pencil, white crayon or sidewalk chalk. We have two windows side by side here in our project. So for the upper left window, there's one triangle for an eye. In the upper right window, there's one triangle for the other eye. 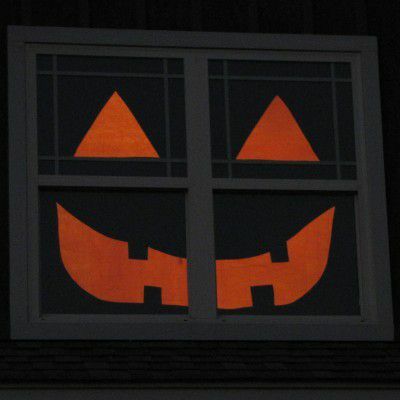 The pumpkin's smile spans the two bottom windows. Freehand the pumpkin face. It doesn't have to be a masterpiece. Sidewalk chalk is forgiving if you need to make a few attempts at making your pumpkin's face symmetrical. If you make a mistake with sidewalk chalk on the poster board, rub out the lines with your hand and start over. Draw until you're happy with the design. Carefully remove your poster board one window at a time. It's time to cut out your design. Cut along the lines you drew in the previous step. Make sure your scissors don't stray too far off your lines. This is especially important if your windows are side by side. You don't want your pumpkin to have a crooked mouth. For the eyes, use a craft knife to cut a line from the top of the triangle to the bottom. This gives your scissors just enough room to cut from inside the triangle. If you have a steady hand, you can also opt to cut the triangle eye with the craft knife instead of the scissors. Now that your design is cut out, you're ready to secure your poster board one final time. Only use a few pieces of tape at first to make sure your design lines up, such as one side of the mouth not appearing to be lower than the other or an eye that's off center. When all looks good, tape the poster board securely to the window. Use enough to ensure your poster board won't fall. Stand back and say hello to the pumpkin face smiling at you. Take one sheet of orange tissue paper and smooth it over the cutout until there are no wrinkles or gaps. Tape it to the poster board. Do this for your entire cutout. For our project, the mouth is wider than a sheet of tissue paper. But when the light source is on at night, we didn't want the edges of the tissue paper to show a dark line where the paper overlapped. Carefully line the tissue paper edges up and use a small piece of tape to fasten them together. Now your tissue paper edges won't show. We also wanted a darker orange glow to our pumpkin, so we repeated this entire step and added a second piece of orange tissue paper on top of the first. For a lighter orange, almost yellow because your light source will go right through the paper, don't double up on the tissue paper as we did. Just use one sheet of tissue paper per cutout opening. When you're finished, the sunlight will give you a sneak peek at what your pumpkin face will look like at night. You can also expect your entire room to have an orange glow to it during the day! Of course, you're seeing the backside of your pumpkin here. He'll be an impressive sight from the outside of your house. As you can see in this picture, we had some light coming through the bottom. This was an easy fix. Using scraps from the poster board we cut earlier, we simply taped little strips to the bottom of the window to cover the light. Make any final adjustments carefully. Smooth wrinkles in the tissue paper. Take another look at your poster board and add tape where it seems loose. Who's that up there in your window? To light your pumpkin, simply turn on your overhead light in the room. As night falls, your pumpkin's orange glow will get darker too. Pair your smiling pumpkin with a ghost and pumpkin tree for the ultimate Halloween decor. Or turn your home into a haunted house with more than 30 decorating ideas. Your pumpkin window decoration is large enough to stand on his own or can fit right in with your other decorations, which makes him the perfect Halloween accessory. Happy Halloween!